Remove the wrapper, put noodle on a dish and put in microwave on HIGH for 1 minute. Stir it well with sauce sachet. Ready to serve. Put noodle into boiling water for 1 minute, drain away the water. Stir it well with sauce sachet. Ready to serve. Allergy Advice: Contains Wheat Gluten, Soybean, Crustacean (Shrimp), Mollusc (Oyster), Fish. 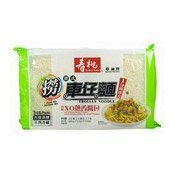 Ingredients: Noodles: Wheat Flour, Water, Corn Starch, Wheat Gluten (Wheat Gluten Protein), Salt, Vegetable Oil (Contains Soybean), Thickener (E401), Acidity Regulators (E500(i), E270). Sauce Sachet: Palm Oil, Shallot, Soy Sauce (Soybean, Wheat, Salt, Water), Dried Shrimp (Crustacean), Oyster Sauce (Oyster, Water, Salt), Artificial Pork Flavour, Artificial Chicken Flavour, Sugar, Salt, Flavour Enhancers (E621, E631, E627), Seafood Flavour (Flounder), Colour (E150a), Colour (Capsanthin). Simply enter your details below and we will send you an e-mail when “Trolley Noodles Dried Mix (XO Shallot Sauce) (壽桃XO蔥香醬車仔麵)” is back in stock!